We're a team of four Olin College students and this is the website for our marshmallow-launching Confectionery Cannon. Have a look at our mechanical design! 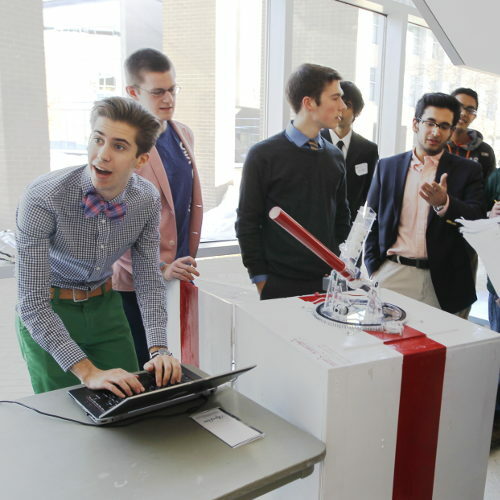 The Confectionery Cannon was designed primarily in Solidworks and fabricated entirely on campus at Olin. Check out our code and electrical systems! 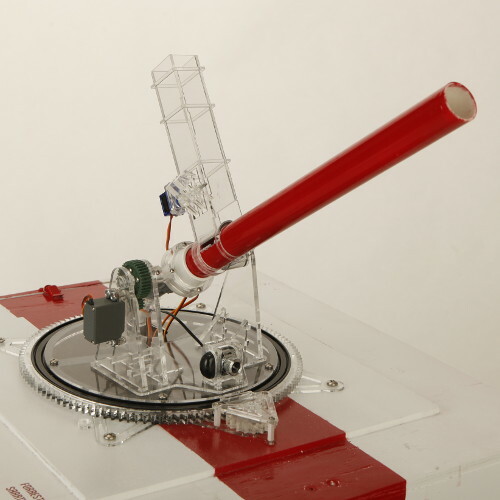 The Confectionery Cannon was programmed using Python and Arduino C; it uses OpenCV for face tracking. The Confectionery Cannon. It's a face-tracking, auto-reloading marshmallow turret. We used many of Olin's fabrication resources, including the mills, lathes, and laser cutters. 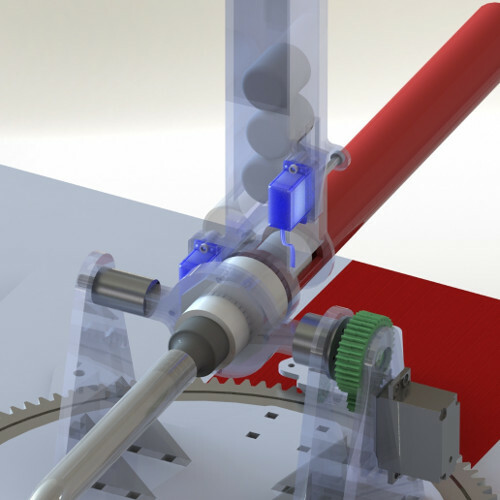 After sketching out a few initial designs, we designed the entire system in Solidworks. Most of the parts are acrylic, which we chose primarily for its cost and ease of laser-cutting. Acrylic isn't very strong and is quite brittle, but it's less than a third the cost of acetyl (Delrin). The three aluminium parts were made from shop scrap. It's electrical. See for yourself. We put some paint on it because we could. We got face tracking with OpenCV for Python and motor actuation through serial communication between Python and Arduino. To control our mechanical and pneumatic system we developed a robust electrical system. We use a custom protoshield on our Arduino to connect and control our four servos, and we trigger our pnematic launcher by controlling a solenoid on a sprinkler valve. On top of all that, it works. Checkmate. As you can see, we always maintain an atmosphere of composure and decorum while working. Forrest was once told by a Nordstrom employee that he's "too fashion conscious." When he's not checking himself out or fixing his hair, he knows how to spend class time un-wisely. Yet, he is loved by his professors who, according to Prof. Aaron Hoffman, find him "on the whole, more amusing than insubordinate." You can find his personal website here. The best looking member on the team, Saarth enjoys long walks on the beach and candle-lit dinners, but only in his spare time when he's not writing team bios. As a fan of buzzwords, he has made the team ten times more lean, innovative, and agile. With the eventual goal of taking over the world, he has promised his other three team members position on his cabinet of anarchy. His closest peers refer to him by just his last name, Searing. He's the type of person that would buy 100 grams of magnesium just for fun; if you're a member of the FBI or US Customs, it's for dietary supplementation. Known as the team bully, he motivated us by exploiting our physical and emotional weaknesses. Also, he has a white patch of hair on his head and it looks silly, hehe. The name is Wyse... Elliot Wyse, and he likes his "undisclosed beverage" shaken not stirred. Known as the ace of all trades, he brings a unique skill set to the team, his work ethic. Also, he is really fast. Want to see him run to that hill and back? Want to see him do it again?